Approx. Weight: 11 lbs. 5 oz. You are in steak burger heaven. This huge assortment is loaded with top quality burgers. These are gourmet steak burgers, so a change your perception of a burger. These burgers are made from American Kobe-Wagyu beef, USDA Prime beef and Angus beef; you've got them all. This is a prime variety pack that you will be the highlight of your backyard party, tailgating, neighborhood barbecue or a special family get together. 8 (8 oz.) Wagyu Steak Burgers - These burgers are made from the trimmings of luscious American Wagyu beef steaks. Wagyu beef is known for its high degree of marbling and depth of flavor. These Wagyu Steak Burgers will melt in your mouth. 8 (8 oz.) USDA Prime Burgers - These burgers are made from steak trimmings from Prime beef, the highest quality beef assigned by the USDA. Grill them about 3 minutes on each side and don't forget to let your burger rest for about 5 minutes before you dive in; this allows the juices to be reabsorb. 12 (4 oz.) 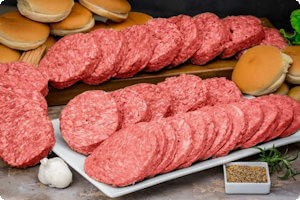 Angus Steak Burgers - These steak burgers are made from select trimmings from 100 percent corn-fed Angus beef steaks. They will be perfectly aged for 4-6 weeks to lock in flavors and texture.